Spacious three bedroom detached bungalow in a garden plot approaching a third of an acre. Plentiful driveway parking and an attached double garage. 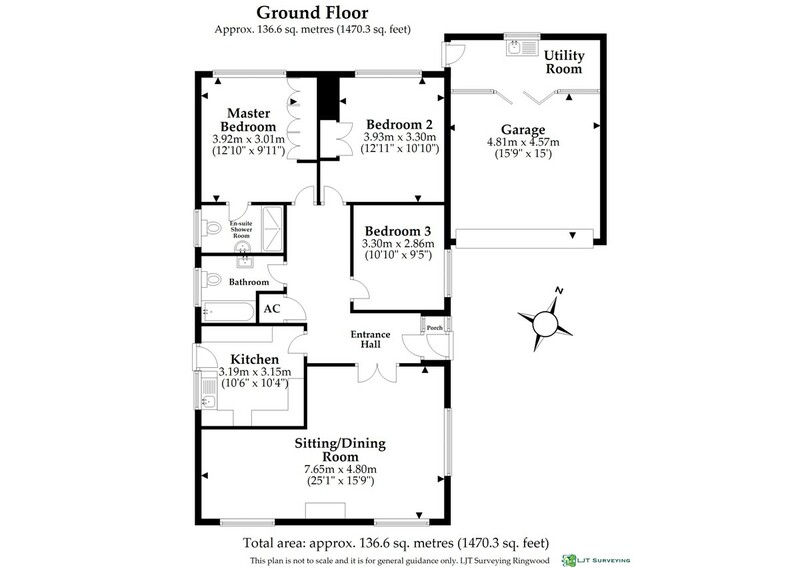 Large L shaped lounge/dining room, Master bedroom with en-suite shower room, family bathroom. Well presented throughout with scope for updating and extending (STPP). No Onward Chain. SUMMARY Spacious detached three bedroom bungalow on a garden plot approaching a third of an acre, with plentiful off road parking and an attached double garage. The bungalow is well presented throughout with full gas fired central heating, Upvc double glazed windows and labour saving white Upvc Soffits fascias guttering and down pipes. The property offers scope to modernise and extend (STPP). No Onward Chain. SITUATION The bungalow is located in a prime residential area within the village of Ashley Heath, which is situated on the outskirts of the market town of Ringwood. The area offers easy access to commuter routes which include the A31 to Southampton, Winchester and London and the A338 to Bournemouth and Poole. Moors Valley Country Park is within the confines of Ashley Heath and offers an eighteen hole golf course, miniature railway line and many woodland walks which include The Castleman Trailway, a beautiful and scenic heathland walk, and includes a cycle route. There is also a convenience store within easy reach by car. Adjoining Ashley Heath to the southern side you can also find the parish of St Leonards and St Ives along with Avon Heath Country Park, Dorset’s largest country park. ACCOMMODATION Paved step and coach light, white aluminium framed double glazed front entrance door with side panel window leads into an entrance vestibule, with a further door into an extremely spacious L shaped entrance hall; built in airing cupboard with factory lagged hot water cylinder, immersion heater and slatted shelving, access to attic space, double multi pane doors lead directly from the entrance hall into the L shaped lounge/dining room which extends across the front of the bungalow with a South and East dual aspect, central stone built mock fireplace with hardwood mantle, serving hatch to the kitchen from the dining area. All other rooms are approached from the entrance hall via white panelled internal doors. The kitchen has a range of marble effect laminated work surfaces with half tiling above, cupboard and drawer kitchen units beneath the work surfaces, matching wall hung kitchen cabinets, space for a slot in cooker, gas point, recirculating type extractor canopy above with multi speed fan, further matching work surface with cupboard/drawers beneath, adjacent tall cupboard housing a wall hung Worcester ‘Greenstar’ central heating/hot water boiler, side aspect entrance door with bulkhead light above. The master bedroom enjoys a rear garden aspect with fitted triple wardrobes offering plentiful clothes hanging space and storage, door leads to the en-suite shower room; low flush wc, pedestal wash hand basin with mirror and strip light above, fully tiled shower cubicle with thermostatic shower valve with rail and shower curtain, wall hung medicine cabinet. Bedroom two is adjacent to the master bedroom with the same rear garden aspect, built in double wardrobe with a box cupboard above. Bedroom three is also a double bedroom on the east side of the bungalow. The family bathroom is fully tiled with a pampus coloured three piece suite; pedestal wash hand basin with mirror and tempered glass shelf above, shaver socket, low flush wc, panelled bath, mixer tap/shower attachment, shower rail and curtain above the bath. EXTERNALLY The bungalow is well set back with plentiful driveway parking which extends to double width parking, and an adjacent hammer head immediately in front of the attached double garage with electric twin ‘up and over’ doors. The garage has power and light and is partitioned to the rear to create a utility area with single drainer sink unit and tiled flooring, there is a personal side door from the garage into the rear garden. The front garden is retained to its front boundary by low white Upvc ranch style fencing, which is adjacent to the aforementioned driveway, and is mainly laid to lawn, with well stocked flower and shrub borders. Either side of the bungalow there is secure access into the rear garden. The very large North Westerly rear garden offers a full width paved patio, where there is sited an aluminium framed green house, leading onto an expansive lawn with well stocked borders containing a profusion of ground cover shrubs and ornamental trees. A pergola with a climbing rose trellis is also sited in the rear garden and is positioned in a Southerly direction.